Lightly toast the sesame seeds in a small pan until fragrant and just turning golden brown. 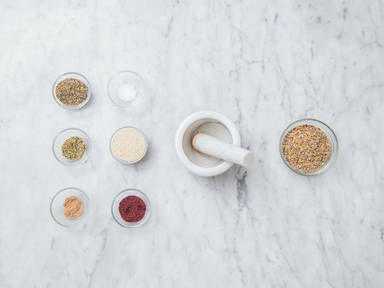 Put dried thyme, oregano, salt, sumac and ground coriander in the mortar and pestle and grind together finely. Put toasted sesame seeds in a small bowl, and add the finely ground herbs. Mix together and store in an airtight container. Use it as a seasoning for meats, sprinkle it into olive oil for a bread dip, top grilled veggies or hummus with it, even put a pinch on a fried egg!